I did my first First Aid Course when I was 14 and continue to refresh my certificate every three years (sometimes more often). I also did a spell as a trainer a number of years ago. I think anyone involved in teaching or working with young people should do at least a basic course (it should be part of Initiual Teacher Education). For my three year re-fresh this time around I joined a Rescue and Emergency Care Course organized by Leading Edge Expeditions in Dorset. There were twenty of us on the course and although I wasn’t sure if I would know anyone – I was delighted to find some familiar faces from past outdoor education work and expeditions. One of the other nice things about the course was the number of young people who were attending and also going away on expeditions this summer. This included groups who are off to Ecuador, Kenya and the Alps. Three more years until the next up-date – I wonder what the ratio of rescue breadths to chest compressions will be in 2014? 2010 was officially the year that I started to feel old. The final proof came when my picture appeared in the ‘flashback’ / ‘blast from the past’ / ‘historical photographs’ section of the Dorset Evening Echo (17th December 2010). I was meeting Santa at a 1982 Dorset Evening Echo Children’s Christmas Party. My Grandfather worked there for a number of years before he finally retired and I used to go along to meet Santa, watch the magician and eat a party tea (of mainly sugar!) when I was younger. Can you spot me in the photo? and Happy Christmas! This is the forth in a series of ten posts about my recent visit to the 2010 Education Show in Birmingham. They document some of the products that I saw, liked and enjoyed from the exhibition. I admit to being a huge fan of Stephen Heppell’s work and I really admire all of the interesting things that he is doing at the moment around school design. Stephen had a exhibition space in the middle of the 2010 Education Show titled ‘Cool Schools’ – the space was used to showcase some interesting furniture, for a series of presentations on school design and to listen to students present from a variety of schools. I went to see the second presentation on school design on the Thursday and really enjoyed looking at some of the great pictures of schools buildings of projects that Stephen has been involved in over recent years. A lot of the thinking is incredibly practical, sustainable and innovative and puts many Scottish new builds to shame. Key design characteristics: Lack of corridors, lots of open space, wide stairway doubles up as a lecture theatre and a skateboard track around the outside of the school! Key design characteristics: The Thai Knowledge (TK) Park sits on the top floor of a shopping mall in Bangkok and is open for all ages whenever the shops are open. The library area (shown above) has proved a hit with young readers who need to climb up to access the books they want to read. The tough books are at the top, crash mats are at the bottom! Not a school but the Salture centre in Glasgow also got a mention. If you are Scottish education and you have not been to visit the Saltire Centre you must go and have a look at it. It really is a fabulous space to learn in and just be in really! Like some other learning spaces that Stephen showed it sometimes makes use of inflatable rooms to which can quickly and cheaply turn larger spaces into more intimate places for project work and quiet discussion. After his talk I managed to get an opportunity to chat with Stephen and we talked about schools design, his new Portland Academy and possible models of future teacher education. We finished our conversation by both enthusiastically agreeing on one very important thing. The next ten years is going to be more exciting than ever for UK education and learning! On Saturday Clive Burgess, Mark Salmon and I ran a youth expedition seminar for Learning Edge Expeditions. The aim of the seminar was to provide future expedition leaders will advice and support on running their own trips. I was given the task of speaking about 'Managing Risk on Youth Expeditions' and also providing some sources of information on possible ventures, venues and ideas. If you were at the seminar and would like further information and advice please get in touch. 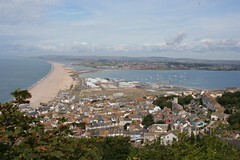 NOTE: The picture above is Chesil Beach on the Saturday afternoon. the waves were wild! I’ve been thinking about developing a resource around the old Eldridge Pope Brewery Development in Dorchester, Dorset. I picked up some materials to help with this when I was back at home over the Christmas holidays. My Uncle Dave then sent me a link that he thought might help – and I think its one to check out for all Geography Teachers. The link was a complete free web based GIS package for the whole of . The main purpose of the resource is to show when roads in Dorset are being repaired but in doing this it gives the user a powerful GIS system including all of the following layers for the whole of Dorset. Please note: in order to explore the layers you need to click on the layers tab on the left hand side of the screen. I think this resource could be very useful for Scottish teacher who teach the Coast as part of Higher Geography. The plug in driving simulator is very, very cool – definitely check it out. Particularly for some of the big US Cities that have 3D Buildings in them. This is a fantastic tool and surely the future of GPS. I would expect to see this as an iPhone download from the Apps store or on the Android platform soon! Back to work tomorrow and its been a good and busy Easter and has included a trip to Weymouth and our Open Canoe Expedition Across Scotland from Mallaig to Inverness. The trip ended up taking six days and was very rewarding and very tough, in particular the carry, drag and pull over the watershed that divides the East from the West. You can see some photos of the trip in Flickr Set and I have embedded some others using Splashr below. Clive and Louise are getting hitched this weekend. So I'm catching the first flight to the sunny south tomorrow moring. Looking forward to a weekend away. But before that there is a MGS staff Curry Night at the Kings Balti in Edinburgh. It could be a jam packed weekend!